Hi all, whether a RSSOC member or not I'd like to ask for some assistance please with the Club's Coupe register. We have information on many of the production Coupe's (or SE4, SE4a, SE4b and SE4c), but still have a lot of of gaps. We rely on owners letting us know about ownership changes and modifications, but appreciate that sometimes you're too busy enjoying your car to find time to update us. The register is held by the club with the ultimate aim of tracking down the fate of every one of the 1006 SE4 model Reliant Scimitars made. None of the information is shared with the commercial world and is held in a secure database purely for historical reasons. The only time I would share information from the register is when a former owner gets in touch asking about a car they once loved, then, with the current owners permission I would let them know how their old car is nowadays and, again with the current owners consent, put them in touch with their old cars so owners past and present can share a bit of history. In order to update the current database, I am asking that every Coupe owner on this site to please send me their info again so I can make sure everything on the old records is up to date, I know this is a lot to ask but it would be a huge help, please don't worry about the risk of duplication, I'll make sure the records are checked and accurate. I would also love to receive any pictures you have of your car for use on the list (even if it's in pieces, or not what you'd consider a show winner) and also I would need the registration number, chassis number, engine number and any stories you might have about the car (where it's been, how it's been repaired/modified, anything which tells its story). 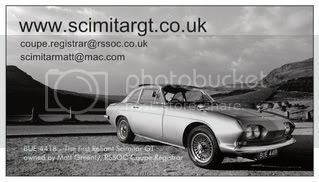 Eventually the basic elements of the registered cars will be listed on my website (http://www.scimitargt.co.uk) for all to see but If you don't want your photos publishing but would like them in club archive please let me know. As I say, none of the sensitive information (chassis number, location etc) on this form will be published in the public domain, but it will be kept with the Club's Coupe records. And finally if you've written off, broken up or scrapped a Coupe, I'd like to know about that too. It would be interesting to know how many of these cars are still in use as most are now over 40 years old!!! And also it will help to prevent anyone from steeling the identity of a scrapped car. or any stories about your car? Well, fancy that!! The first person to send me details of their coupe for the register happens to own the oldest known Coupe with chassis number 3. Thanks to Eric for kicking off my hunt for all 1006 cars, wonderful pictures too, it's an absolute credit to him. Last edited by ScimitarMatt on Thu May 07, 2009 8:33 pm, edited 1 time in total. Following a couple of kind souls sending me their own versions of a register, I've managed to blend them all together to form one record which now has 144 cars, some with chassis numbers and records, some without so not bad so far. Just a quick note to let everyone know that the email address published in Slice 227 (coupe.registrar@rssoc.co.uk) is still going to the old registrar, John McGowan, and not to me. Until this is sorted can anyone who wants to get in touch with me, please email me directly at scimitarmatt@mac.com? Matt why not set it up so it can be filled in and sent as an email attachment then you dont have to worry about posting. i have just got of the phone from a chap wanting to know the value of a 1964 GT, he said it has a straight six engine with three SU carbs. it is i am told the car that i saw approx ten years ago sitting on someones front garden but has now changed colour from the weathered cream i assumed was original. the asking price is way too high especially as i am told it is not in too good a condition although it is still in daily use, the asking price is 15000 rands, thats a little over a 1000 GBP. i have asked if i could have the chassis no. etc for the records but lets see what comes back to me. thanks for your message, a set of details (including photos if possible) would be fantastic for this car. As for values, £1000 GBP sounds about right for a straight six car which is in daily use, even if it's a bit tatty. Well, I think thats a reasonable price for one in the UK, I've no idea how it fits with general classic prices in SA. I have paid more for my straight six coupe and although original (except paint), I've not heard it run so have taken a chance. Straight six cars carry a premium for rarity, and S6 owners say they are wonderful, some even say better than the V6 coupes (I've not compared the two yet, and everything comes down to personal preference). 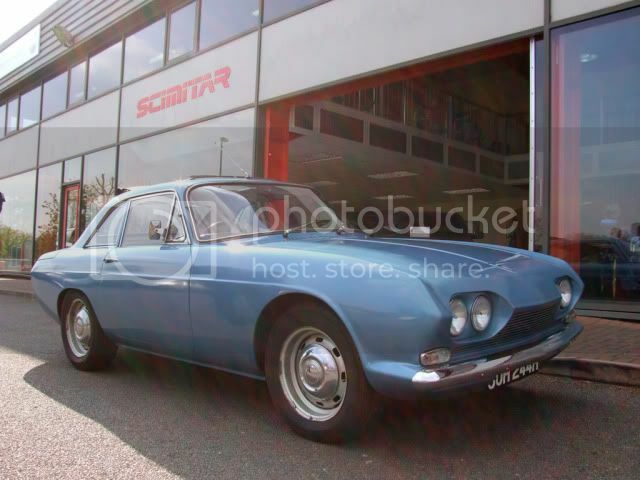 the original question i was asked was what is the car worth, and my answer was thats dependant on the buyer if he can get one, scimitars are not a very well known make here and add importing rare spares for the older cars and i can understand why there is a lack of interest in taking on such a project, i am told that the chassis on this car is in need of work, standing on grass for a good few years wouldnt have done the car any favours. if the car is still in geoffreys bay then i feel a trip down there is on the cards, i have just bought a new car for the wife so theres the excuss i need for a road trip. finally with a little arm twisting here are the details for the coupe in jefferys bay s,africa. i am sorry but i do not have much more info on this car as the owner now knows i am not interested in buying the car and as stated in another thread he owns it because of a non payed debt. joking aside, if i can help with a phone call or two to help the cause then its only a pleasure.